I received an e-mail with a rather perfunctory heading ("Why not? "), no salutation, that question and the signature "cz". As Countess Cora Crowley said, during a tiff with the Earl, "I shall not address the tone of your remark", but I shall deal with the substance. The pearl oyster and freshwater pearl mussel produce and deposit nacre on the shell (called 'mother of pearl') and on the pearl. (For a more detailed definition of nacre, see here.) The successive, overlapping layers of nacre give pearls their lustre. Lustre refers to both brilliance (how the surface reflects light) and glow (how the layers of nacre refract and diffract light). Thick nacre doesn't guarantee high lustre; lustre depends on the pattern of nacre, but thick nacre is far more desirable than thin. 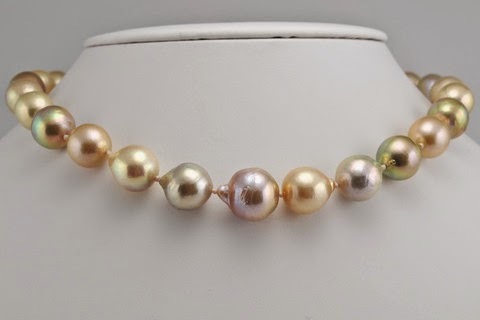 The best pearls also display orient, defined by Professor Barbara W. Smigel as "a delicate, shifting, iridescent color layer that is distinct from the basic body color of the pearl or from its lustre... 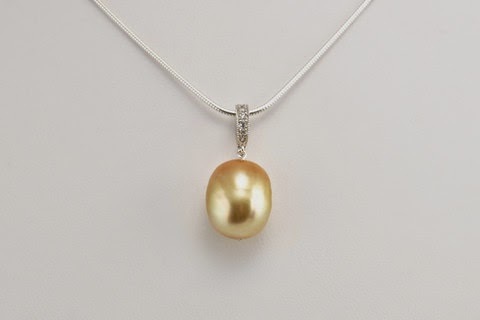 Although most pearls have that characteristic 'pearly luster', only fine quality pearls have orient." Imitation pearls are made from a shell or glass bead coated with a solution containing fish scales or other iridescent material. They will never have a fine pearl's lustre and depth, and their iridescence (should they have any), is like poly satin compared to silk charmeuse. Fakes are usually "too-too": too perfectly matched, too round, too sharply lustrous. The overall effect is like being hit by high-beam lights, and about as soulful. Expect to pay more for genuine pearls, but thanks to advances in pearl farming, there is not as wide a gap as you'd think. A pair of good quality fakes, Majorica 8mm round white pearl studs; price, $55 at Sak's. 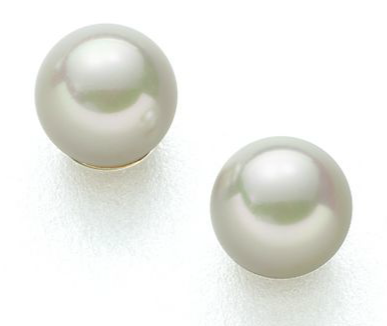 A pair of 8-9mm round white freshwater pearl studs from Pearl Paradise; price, $115. You can see the difference, no? 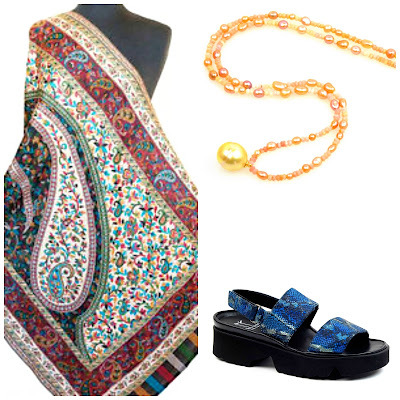 Once you decide to wear genuine pearls, read, look and follow your taste. For me, orient trumps roundness, and perfectly smooth surfaces are not my first criterion. I avoid pearls dyed any colour not found in nature, and am wary of that enhancement even if the dyed pearl is "pearl coloured", because dyes can eventually mottle a pearl or fade. If it's not terribly pricey and you love that dyed colour, go ahead. Jewelers will swear the dye is stable, but it's done at the farm, not by them, so how do they know what will happen in 10 years? Fakes range in quality, from the intended-to-fool-no-one $25 gumballs at H&M to the $250 "South Sea" strand, below by Magnificent Costume Jewels—and up, once a designer name is attached. A pendant of one spectacular pearl is far more charismatic than a necklace of fakes, or the bleached, banal whites I see at department store counters and even brand jewelers. Warmed by your skin, lighting your face, genuine pearls simply have no equal. Fakes have a place, but if you can try on the real thing, "cz", I'm betting you'll see the difference. I like fake pearls when they are worn to be fake - as you say, the H&M variety. But you've convinced me over the years that fresh water pearls have taken the place of the "good fakes" of yore. I love to wear real pearls....the glow and warmth cannot be faked. I can understand wearing fake until one has saved enough money to invest in a forever pair of earrings or a necklace. I'd say you've made your case very convincingly! Most of my pearls are real, though I have two fake pieces that I love. One is a vintage Majorica three-strand choker with a silver and pearl clasp, which looks beyond elegant in the evening with a simple dress. The other is a single strand necklace with a subtle contemporary circular clasp containing a small pave diamond - an impulse buy years ago at Fortnum and Mason. I also have earrings which echo the clasp and have (joy) removable pearl drops so you can wear them with or without the pearls. If I wear them with the drops I usually pass on the necklace! I do love pearls. I think each pearl is a beautiful unique elegant treasure. To me what makes them so wonderful-the natural beauty- is of course missing in fakes. I do have 3 fake pieces which I enjoy wearing, but I tend to think of them as "beads" not pearls (as LPC says-they are worn to be fake). I too have found (through Duchess's wonderful posts and a very helpful email)that there really are beautiful and unique pearls available to us now that are very reasonably priced and easy to find online. A fake piece or two may be great, but they just aren't pearls. LPC: The best CFWPs go above merely replacing fakes, and I am happy I got you there. hostess: Genuine pearls can be had for so little these days that it does not take long saving, unless of course your taste runs to the South Seas. materfamilias: Thanks and I wonder what "cz" thinks! Jane: The clasp on the single strand could one day be placed on genuine pearls should you wish. Cathy: That's a nice distinction, beads vs pearls. 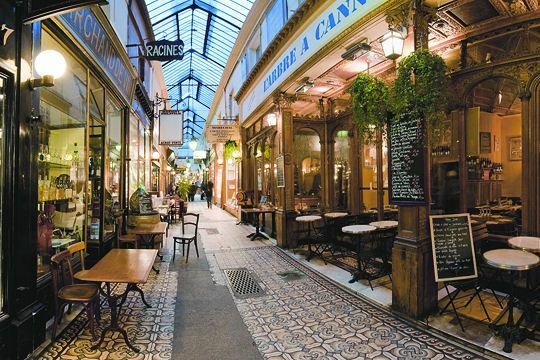 In French, "perle" means "bead" which initially confused me when I friend said she had been shopping for "perles". So, no more Chanel or do those pearls fall into a different category? I have been reluctant to buy the Chanel's because I know I can get real for less. Should I reconsider? Love your site and appreciate the education. Interesting post, I like the way you made your case. Real just seems more satisfying, whether it's silver, polished stone, glass, pearl or gold and gemstones. 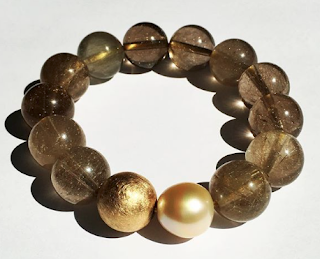 I could see a woman buying a fake strand of Tahitians or South Seas to wear while traveling (even on the subway), but I cannot ever imagine someone choosing fakes to wear over real pearls. NOW, dear Duchesse, a question....I have a lovely pair of 8-8.5mm stud earrings, but am coveting a larger pair, probably a 9-9.5, just for the heck of it, to wear to death, just like I do the others. Am I better off getting freshwaters, or Akoyas (South Seas are not a budget option, although I can save for my 60th), for the orient?? Pearl Paradise also sell Hamadama akoyas, and a competing, better-priced freshwater variety they call "Freshadama", a beautiful classic pearl look. Quality CFWs will give you a much wider choice of body colour, and beautiful overtones at better price. 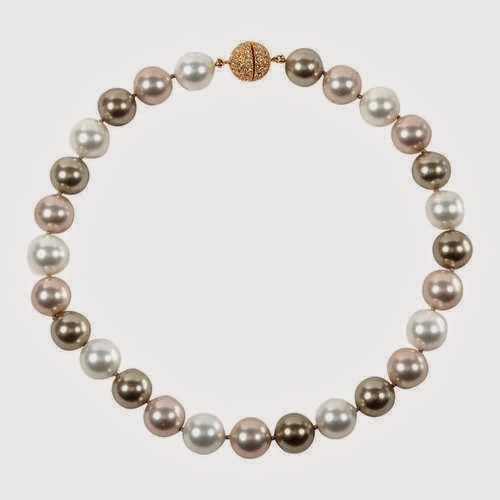 If you want unusual pearls (many freshwaters but also some South Seas), look at the Kojima Company site regularly and again ask; they will also look for you on their trips to China and Japan, without obligation. And if you have not already, check that size on your ear. A pearl that looks happily big around your neck can look huge on your ear. There is such a things as too big in a stud, which (depending on your ear) can droop even with those disc backs. All of the vendors I have mentioned have excellent full-return policies so order away till you find 'yours'- and please tell us what you picked! If one is a collector of Chanel •costume• jewelery, that's a particular interest. The Chanel designs will be more sophisticated than many other costume pieces, but they are still soulless fake pearls, whatever the label. Yes, I know Chanel herself mixed real with fake, but that was when a strand of genuine pearls was the price of a car or more- and she was a canny merchant. A glance at eBay shows Chanel costume pearl necklaces (some mixed with other artificial stones) priced between $435-$900. You might want to think about a genuine pearl rope with a standout clasp, perhaps made from a vintage brooch or dress clip. Now,there is also Chanel's •fine• jewelry line, glamorous, fabulous-and priced accordingly. (I did not see pearl pieces in a quick peek at the current collection- lots of diamonds and sapphires.) Fun to drool over! I'd say 'each to their own'. Wearing fake pearls isn't immoral. Personally I happily wear 'real' and 'fake' jewelry as the mood takes me. It is worth having the knowledge you impart to be able to recognise and admire the real thing even if we can't afford it or would rather not wear it. Eleanorjane: I am curious about "or would rather not wear it". I am wondering why that might be.